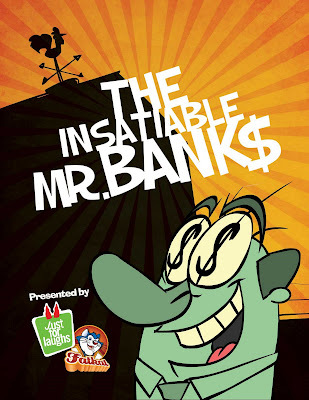 ★ LOOGAROO ★: MR.BANKS - COMPLETE! All done folks, looks pretty decent too for our first short. I had a ball doing it even though it took a lot of sacrifice of family time. Some things I'd love to change too however for the sake of time, money and losing my wife, I'll fix certain things later. I won't be uploading it just yet, as I want to present it to Just for Laughs at the Banff festival in a couple of days and get their feedback. Then you can all rip it apart! But big thanks to Mick Harrison, Dacapo Productions, Jason MacArthur, Ian Brenneman, Jon Weldon, Andy Coyle, Beans, Robbie Anderson, Buddy Bolton, Ryan Keizer, Justin Salgado, Steve Bennett, and most of all our great partners with Just for Laughs for believing in us and partnering with us on this show. Extra Special thanks go to My wife Tara and my boy Gavin for their patience and to my parents whom have helped fill the void in my absence!